Seattle enjoys a high standard of living and is a hub for innovation and creativity; yet racial disparities persist in our region. According to 2010 Census data, Seattle’s population is predominantly white (69.5%), with people of color accounting for just under a third of the total population. The City of Seattle has worked for years to eliminate overt racist policies and practices in housing, employment, and other areas; however people of color in our community continue to be impacted by systemic race-based inequities. This is why the Seattle Office of Arts & Culture, in conjunction with the Office for Civil Rights (SOCR), is offering arts and cultural organizations the tools they need to begin to eliminate institutional racism and build racial equity through the learning cohorts Turning Commitment into Action. 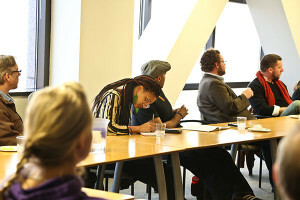 Part of the Community Institute for Racial Equity, these learning cohorts – there will be three of the same curriculum offered in 2015 – include intensive training on skills to address perceived and actual barriers to racial equity within arts and cultural organizations and the sector as a whole. The goal of these cohorts is to help arts and cultural organizations create realistic racial equity action plans. The first Turning Commitment into Action cohort began in May and included 35 participants from 12 organizations: Artist Trust, Cornish College of the Arts, Densho, EMP Museum, Frye Art Museum, Office of Arts & Culture, On the Boards, Pratt Fine Arts Center, The Greater Seattle Bureau of Fearless Ideas, Youth in Focus, Seattle Opera and Intiman. Registration for the first cohort filled quickly, demonstrating the desire of so many arts and culture organizations to actively work toward racial equity. To meet demand, this will become an ongoing program: a second cohort will begin this summer and a third this fall. For more information or to register visit Turning Commitment into Action. To create change, institutions and groups in our community – government, businesses, non-profits, schools, faith-based, parent, youth and neighborhood groups and more – need to work together and share a similar sense of urgency. The arts and cultural community has key roles to play in advancing racial equity within its organizations, and through partnerships, programs, and works of art. Only by joining together in a broad partnership with common goals and strategies can we hope to realize racial equity in arts and culture, as well as in jobs, education, health, development, housing, criminal justice, the environment and philanthropy. We’re pleased to partner with Seattle Art Museum and the Cascade Land Conservancy to present a panel discussion exploring the intersections of race, class and the environment. How does diversity shape a livable, urban environment? How do artists and environmentalists promote diversity and help to define what diversity means in Seattle? The discussion, part of SAM’s Art and the Environment series, will take place 11:30 a.m. to 1 p.m., Wednesday, March 2 at the Olympic Sculpture Park’s PACCAR Pavilion. Join choreographer and Artistic Director of Spectrum Dance Theater Donald Byrd, who will moderate the discussion with panelists Dr. Sharon E. Sutton, FAIA, professor of architecture and urban design and director of CEEDS (Center for Environment, Education, and Design Studies) at the University of Washington; Eddie Hill, farms program manager at Seattle Tilth and former director of Creatives4Community; Julie Nelson, director of the Seattle Office for Civil Rights and Tracy Rector, executive director and co-founder of Longhouse Media and Native Lens. The event is free, but advance registration is required by Tuesday, March 1.